e-Learning is a fantastic alternative, and using real-time data within your online training creates an extremely effective and beneficial learning experience. Pulling in live feeds allows you to deliver the most up-to-date information to your learner, and in some cases, offer a live demonstration of a technique or operation. It just depends on your learners’ professions. For example, if you are putting together e-Learning courses for stockbrokers, then you have a lot of options for using real-time data. Imagine how engaging and relevant you could make your course by pulling in a live feed of the day’s trades from CNN or Yahoo! Stock Quotes. Learners in other finance or international business fields might also benefit from a website that shows real-time rates of currency conversion globally, along with daily market analyses. You could pair this with an RSS feed that pulls in breaking news from business and finance publications. This is very easy to do with authoring tools like Lectora or Snap! Empower, both of which can integrate real-time RSS feeds into your e-Learning modules. For example, if you are training eye doctors, you can share this live Lasik surgery feed with your learners. Every Wednesday, the site broadcasts live surgeries. Your learners can even manipulate the camera to view the surgery from different angles. Live webcams also allow learners in the atmospheric science field to access resources and learning that might not be available where they live. For example, learners can witness live hurricane feeds from Florida via Hurricane City Cams in Delray Beach. Learners in the Great Plains might never be able to experience a hurricane in person, but they can study it in real-time through these webcams. Weather webcams are frequently used to monitor air quality, visibility and major weather events, which are all great topics for e-Learning courses. 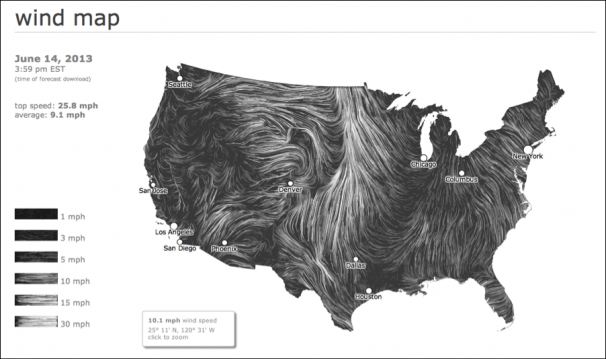 For a beautifully designed, interactive weather source, check out this live wind map that pulls in data from the National Digital Forecast Database. You can zoom in on specific locations and compare current data to the previous day’s data. Live animal cams, like the San Diego Zoo Panda Cam or the Whale Net satellite tracking program, are great for zoology courses, conservationism programs or zookeeper training. Of course, you’ll want to check the webcam regularly to make sure the animals are frequently in view and that the camera is not malfunctioning. If the animals or the camera aren’t cooperating, your online training could get boring very quickly! Check out this Major League Baseball Weather Analyzer. 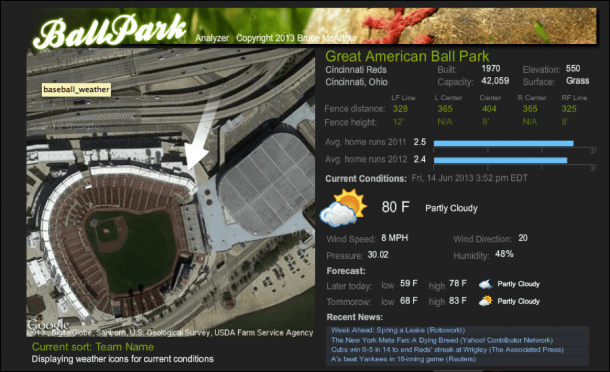 You can look at wind patterns over ballparks, as well as current temperatures and ballpark statistics. It also links to webcams at various baseball stadiums. The website was created to help fantasy baseball players, but it’s also a great example of pulling together different data feeds, analyzing them and drawing a conclusion. Synthesizing and analyzing data are common learning objectives, and this website demonstrates a fun, innovative way to hone those skills. You could even create a fantasy baseball league as an extended group project for your learners and incorporate data from this website into coursework. These are just a few examples of different real-time data feeds that you can incorporate in your e-Learning courses. Spend a few minutes doing an Internet search, and you will find a wealth of information about your desired topic. With an easy-to-use authoring tool like Lectora, you can incorporate real-time data like RSS feeds, Twitter feeds, stream video or embed a Web window directly into your online training. With an embedded Web window, learners don’t even have to leave their courses to find the data they need. By providing real-time data and challenging learners to interpret it and draw their own conclusions, you create an interactive e-Learning experience that directly involves the learners and increases their comprehension of key concepts by showing, not telling. Now go out there and create some great e-Learning!